It's a fascinating thing, the human mind. We know of nothing else in the universe that tries to understand itself. In that respect it may truly be unique. The most remarkable aspect, however, is just how little we do understand our minds at the moment. Throughout history we have tried to explain that which we didn't understand. It is only in relatively recent times that we have developed science and through reason, experimentation and peer review have begun to really explain the world around us. No longer do we believe the sun and moon to be gods fighting each other daily across the heavens. Fire is no longer a supernatural force, nor volcanoes, hurricanes, etc. I sometimes wonder, as I'm sure everyone does, how much fun it would be to grab a caveman from ancient times and show him around the world in which we live (assuming there were no basic language barriers!) What would he think of television, mobile phones and planes? Introducing a primitive to modern technology is hardly a new concept but it is a useful one if we are to better understand ourselves. We are those cave dwellers, the same in all but environment. Would our ancestors fear our technology? When handed a mobile phone would they think they are talking with spirits? Probably. How could they be convinced otherwise? We could rationally explain the technology but it would be fairly meaningless to them. The only way I can think to quickly prove that no 'magic' is involved would be for them to meet the person on the other end of the phone - have them in the same room as they used the phones to talk to one another. Even that may not do it. It may convince them there is no undead on the other end but it would still look like magic. Humanity, for the most part anyway, needs to believe in something greater than itself. Historically this has inevitably led to people simply explaining any natural but inexplicable pattern or occurrence as the work of a supernatural force. That legacy pervades even today. What interests me most about this is how seemingly rational people can fall into the trap of explaining that which they don't understand as somehow supernatural. Not wishing to cover old ground (as in my earlier pondering: Reality) I instead want to consider how and why the human mind/brain gets into the state where a supernatural explanation seems so valid. Look at the picture below. With both eyes trained on it you will see both the cross and the circle. But what happens if you close your left eye, stare at the cross with your open right eye and slowly move your face towards and then back away from the screen? 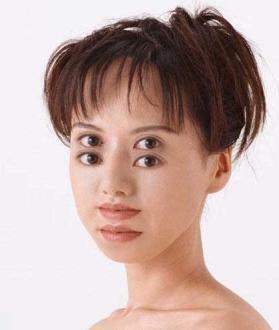 That's the first step to proving that what your eye sees is not what you see. Pattern Matching. I'm sure you've looked up into the sky at the clouds, or perhaps the stars, and have seen patterns that resemble objects or animals. Usually the matches are pretty poor so we have to work quite hard to find such matches but the fact that we can is extremely impressive. It is hard to appreciate just how difficult pattern matching is unless you've sat down and attempted to write a computer program to mimic the same behaviour. It sounds easy because it comes so naturally for us but in reality it is so difficult that the worlds best computer scientists still have yet to get even close to equal the human brain on this. Even the vastly simpler task of recognising just faces (by comparing relative sizes and positions of eyes, nose, mouth, cheekbones, chin, forehead, etc.) has yet to produce a system that even the American Department of Homeland Security will take (they did recently trial a system and found the error rates too high...) To quantify that a bit, a different trial in Boston's Logan Airport, in which the cameras were given photos of employees to detect, was only successful in 153 out of 249 random tests over a year. Even worse, a system setup for the Florida Police in Tampa, that was designed to scan the city's entertainment district for wanted criminals, yielded no positive identifications and no arrests after two years of operation. 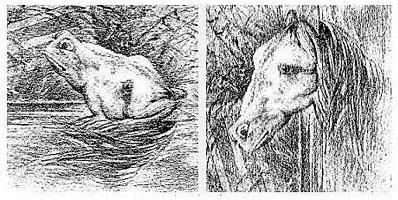 Stepping back from the specific case of faces for a moment, here's a fairly well known 'optical illusion' (optics aren't really directly involved in the illusion, it's down to the pattern matching of the brain). 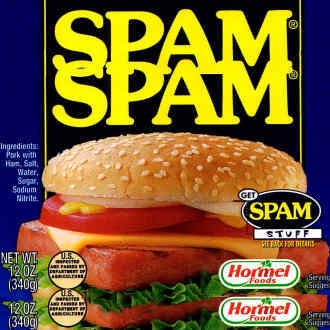 As you can no doubt sense, the girl causes much more trouble for the image processing centres of your brain than the can of spam. 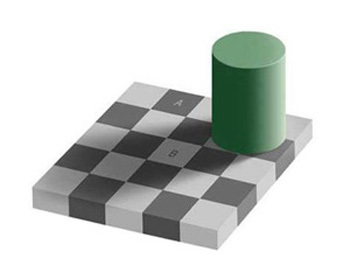 In the above example the chess squares containing the letters A and B have the exact same background colour! It's very hard to believe - even I didn't quite trust it at first - but it is true. If you know how to use a paint program I suggest you check the colours for yourself, it's the only way you'll really believe it! The real clincher that we don't see things as they really are is the way the brain categorises and (if there is such a word outside a Dubya dictionary) objectifies. How many times have you looked around your home for an object only to find it was literally staring you in the face? In your search your eyes would have looked upon the object, possibly several times, and yet you didn't notice it. Your eyes certainly saw it (I don't think anyone really believes things become temporarily invisible) but yet you didn't notice it, i.e. it was somehow lost during the visual processing stages. The light reflected off the item did hit the back of your eyes but, for whatever reason, your brain failed to process it into your mental model of the world - it failed to be an object in your mind, instead it was just part of the anonymous scenery. So when you think you are seeing a simple camera-like snapshot you are not. In reality the rather low resolution image that your eyes gather is actually translated into a 3d virtual representation of the world in your mind. That is what you see - the virtual mock-up of the world that depending on the conditions, your mental/physical state and the objects before you (and your familiarity with them), will vary greatly in terms of accuracy. 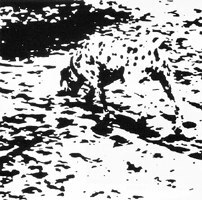 Drawing, painting and even photography is affected by the interpreted nature of human perception. It is all too easy to take what you think is a fantastic photo only to see in the printed result a telephone pole apparently growing out of your subject's head - it was there when you took the photo, you just didn't notice it. Drawing is obviously a lot more difficult than photography for most people. Hand eye coordination is a factor but not as much of one as you might think - there are many people who are, for example, fantastic at tennis but cannot draw even a simple object. Why? It is back to the internal virtual reality we generate in our heads. Somehow that 3d image must be mentally collapsed into a 2d canvas of the world before you can apply any artist techniques to the result. This all leads to the main question of: what is an hallucination? I think most people will agree with the abstract case that people can have hallucinations and that such hallucinations are a product of the mind (i.e. they have no basis in reality). Now that science has begun to uncover the way the mind works we can easily see that such hallucinations must be the erroneous creation of an object in the person's mental model of the world. It is well documented that some types of drugs can cause hallucinations and other sensory processing errors. Neurosurgeons routinely probe their patients brains to assess what effect surgery might have and prompt the conscious patient to experience long 'forgotten' memories and various sensory hallucinations. Because of the distributed nature of the brain and the pinpoint nature of the probing those experiences tend to be simple sensations such as the feeling someone is touching their arm or an odd sense that some predator is watching them. Complex visual hallucinations do happen, however. Night appears to be the time most associated with hallucinations or, at the very least, spectres and strange noises. It is all to do with signal to noise ratio. During the day we are bombarded with stimuli, particularly visual and auditory. At night these stimuli are greatly reduced - lack of light and the quiet as the world around you sleeps. Starved of sensory input your brain turns up its 'gain', it makes itself more sensitive to the reduced input. Unfortunately this means errors are more likely. The inherent 'noise' of your sensory processing is heightened and you are significantly more likely to mistake an input for something it isn't. This can be made even worse if we put ourselves into a state of high alert, i.e. fear, and turn up that gain even more. This is why ghost stories are so much more effective on a quiet spooky night than a bright noisy day. The eerie shadows given off by our artificial lights at the dead of night - shadows that simply are not there during the day. The flickering of a candle or open fire that subtly shifts any shadows makes for an even better way to trick our overworked sensory processors. As you might expect it is even more complex than that. The brain is a lazy organ, understandably so given how much work it must do and how much energy it consumes. Your mental model of the world isn't limited to objects of an inanimate nature. From birth you are observing the world and building up not only a sensory image of objects (i.e. their 3d and acoustic representations, plus how they feel, taste, etc.) but also their behaviours. It turns out that the brain takes shortcuts with sensory processing. Once it has added an object to the mental model is doesn't continually add and delete every time your eye picks it up, that would be wasteful, it actually just saves itself the processing and assumes things. Only if a change is detected does the model get updated. It goes further than that. Based on your knowledge of that type of object and the current circumstances your brain will actually expect behaviour to happen. Apparently the brain effectively polls the real world by asking questions. For example, if you were watching your toaster your brain will keep asking the sensory processors 'has the toast popped up? ', over and over. All the time we are making these assumptions as to what will happen, biased highly by what is on our mind at the time. That is what surprise is - reality doesn't stack up with our mental model and we must update that model and possibly add new behaviours. Surprise is our brains getting out of lazy mode and performing a proper refresh of the area of the mental model affected. This is all why people imagine things when they are spooked, they are expecting something and asking heavily signal noise affected sensory processors 'did I hear footsteps?' Have you ever got yourself in such a spooked state where you are almost expecting something scary to happen? In that situation have you found yourself hearing what sounds like indistinct whispers, part of your mind sure they are in your imagination but still not totally convinced they aren't real? Get yourself into the mood one night and try it - it's good fun seeing how far you can take it! Also notice how you try to snap out of that spooked mood - all the lights on, full investigation of the area, perhaps putting on the TV or radio? All things to up the signal to noise ratio and flush any nasties from your mental model. I am, of course, talking about dreams. Why should there be a special module in our brains to generate dreams? What would be the point of that? Little to none, I would suggest. I am cursed with rarely being able to remember my dreams but every now and then I am lucky enough to have a very vivid dream, though I'm not sure I've ever had a truly lucid one. Obviously we are back to the mental model of the world. Only this world doesn't have sensory inputs correcting the model as required. Instead it is governed by the slightly chaotic ramblings of an unfocused mind. Ever think back to a dream and wonder why something totally bizarre didn't seem odd at the time? That's because, for whatever reason, your brain was expecting that very same thing to happen - so it did. Given there is so little sensory input there is only really noise, noise that the brain is free to interpret in whatever way it sees fit. You are driving down a road with one other person, Willow. Are you there yet? Yes. Have I gotten out of the boat yet? Yes. Is Velma still with me? Yes. Nonsensical and very dream like - the change of transport and companion seems totally natural until you think back on it when you are later awake. There may be a purpose to dreams, they often contain elements of the previous days events, and maybe related to laying down long term memories. One thing that is clear, however, is that dreams are not special or unusual. They are not using a special mental theatre, they are merely our normal mental model unfettered by sensory input (excepting when real world sounds, for example, may be integrated into that model) and that always says 'yes' to our polling questions - for there are no inputs to generate a 'no'. They are, in effect, hallucinations. But then - what isn't? This has deliberately been a whistle stop, gloss over much of the details, look into the human mind. Despite my ramblings it really is a fascinating subject and one I think everyone should have some grasp of. At last, after more than two and half thousand years of documented philosophy, we are finally beginning to understand how the human mind/brain works. And it is far more complicated and interesting than simply writing it all off as a supernatural soul. I highly recommend Daniel C. Dennett's Consciousness Explained (ISBN 0316180661) as a gentle introduction to the subject.